Yes, that is right, my son convinced me to go horseback riding in the desert. I have to say that, it was a good day. 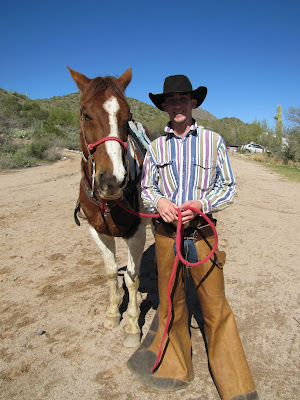 We started here at the ranch in Saguaro Lake. Just a beautiful area. The horses were big! But I guess I knew that. Since I never had the chance to actually get on one, I never realized how BIG they were, but beautiful. Really beautiful animals that were going to carry us for 1.5 hours through mountains and ravines. Pretty amazing when you think about it. Here we are getting ready to ride. My son and I, ready willing and able! The scenery was gorgeous throughout our journey. But I do love the desert terrain. My horse did stumble twice. I wasn't flustered, just hung on and he got right back up. Here we are on our horses... Bert and Mesquite. I kept calling Mesquite, Mackenzie. I don't know why, must be that I just liked that name, who knows? But he responded to me no matter what I called him. Notice in between us the beautiful Four Peaks. They actually had snow on them. I am so glad they were far, far away! You can also see a bit of Saguaro Lake below us. We were up pretty high. That meant we had to come back down. Back at the ranch, I took a photo of our trusty young guide Ken. He was truly a great guide!! Thanks to my son too for suggesting that we do this, it was a great day!! Next up... an ATV tour!